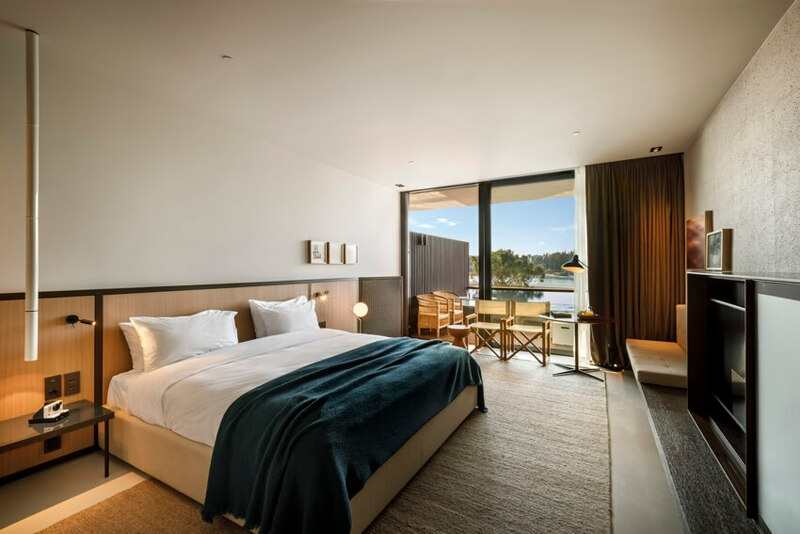 Experience luxury in the most beautiful suites in Rovinj, or enjoy our elegant rooms which combine the best in modern comforts. Each suite or room has its own unique character, with features to make your stay exceptional. The hotel boasts 209 luxurious rooms and suites. Amenity drawer with hairdryer, slippers, etc. We are proud to be a pet friendly hotel and animals are generally welcome on the premises. Unfortunately,there are few exceptions on the rule. In consideration of other guests, they are not allowed in the swimming pool area,restaurants and bars.The hotel also reserves the right to charge for damage you pet might cause. 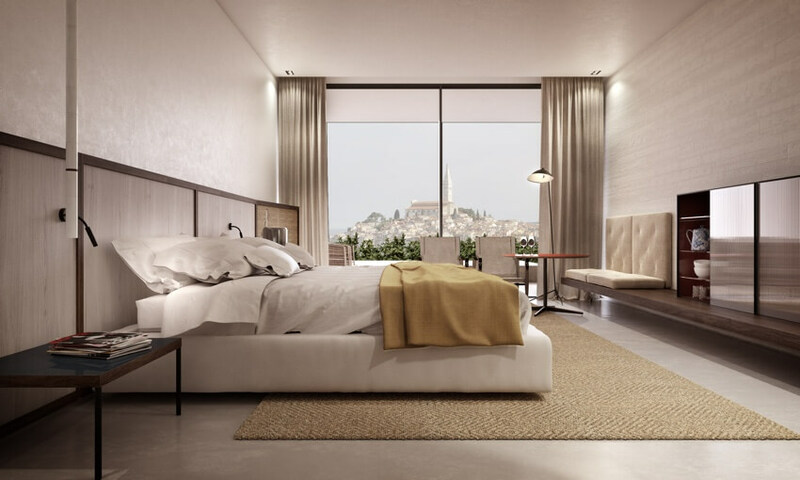 The design by Studio Lissoni gives each room a contemporary, residential feel. All rooms have a beautiful view of the park surrounding the hotel. They are furnished with a king-size bed or two twin beds. 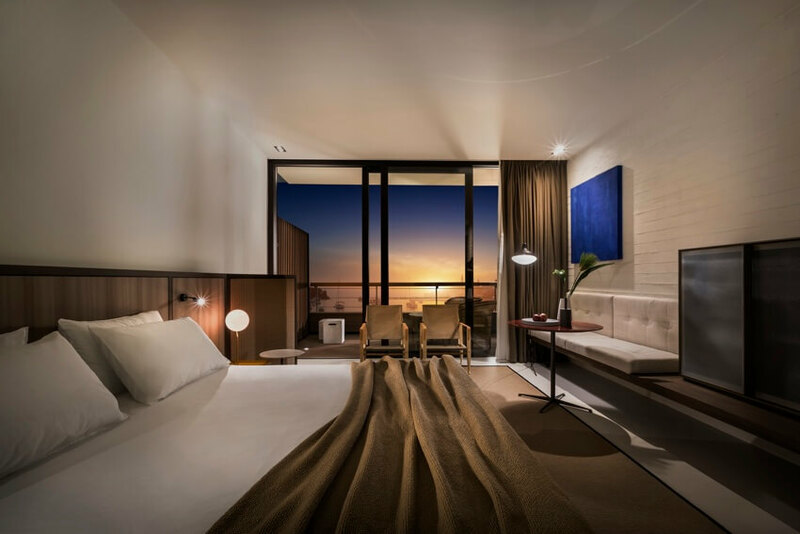 All rooms feature a furnished terrace and a deluxe bathroom with bathtub, separate shower and toilet. Amenities: Bottle of still mineral water 0.75 l with daily replenishment and fresh fruit on arrival. Bottle of still mineral water 0.33 l and goodnight gift. Premium Sea View Rooms are identical to Premium Park View Rooms, but with a marvellous view of the sea, marina and the old town. Deluxe Sea View Rooms are the same as Premium Sea View Rooms but also feature a private plunge pool in front of the balcony. All rooms are located on the first floor. Premium Park View Rooms can be connected to create Family rooms which are suited to accommodate families with children. One room is furnished with a king-size bed and the other with two twin beds. 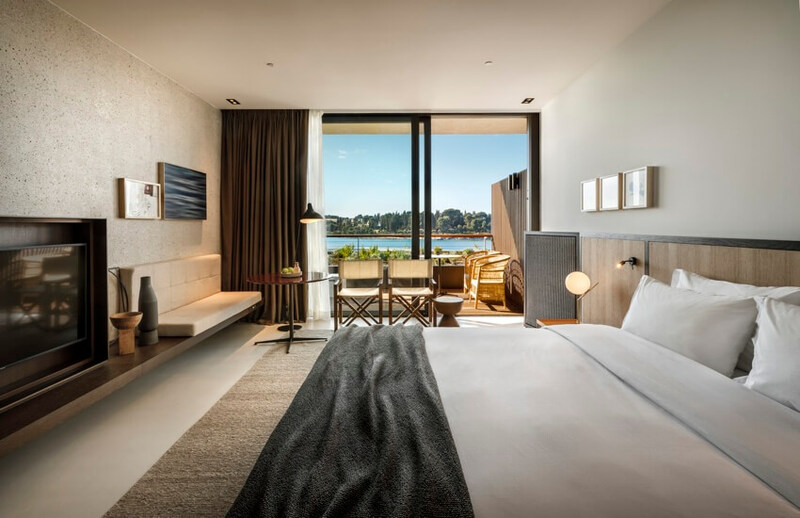 Two connected Premium Sea View Rooms specially created for the comfortable stay of families (two adults and two children or one adult and three children). Family rooms offer the comfort of two Premium Sea View rooms at a unique price. 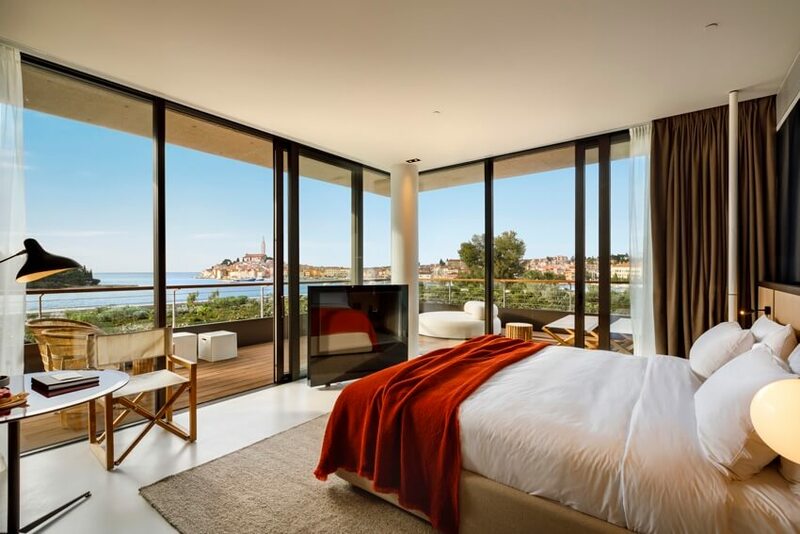 Grand Sea View Rooms are 63-70 m2 in size and have balconies affording views of the sea and the old town of Rovinj. The rooms have a living room, one bedroom with a king-size bed and a bathroom with bathtub, separate toilet and shower. Amenities: Bottle of still mineral water 0.75 l and fruit of the day combo deluxe with daily replenishment, sweet tartlet on arrival. Bottle of still mineral water 0.33 l and goodnight gift. The Duplex Suites are spacious and bright due to a large glass front spreading over two floors. The floors are connected via a staircase leading through an open atrium. The upper level features the entrance, guest toilet and a large seating lounge. The lower level accommodates the bedroom, a walk-in wardrobe and a deluxe bathroom. 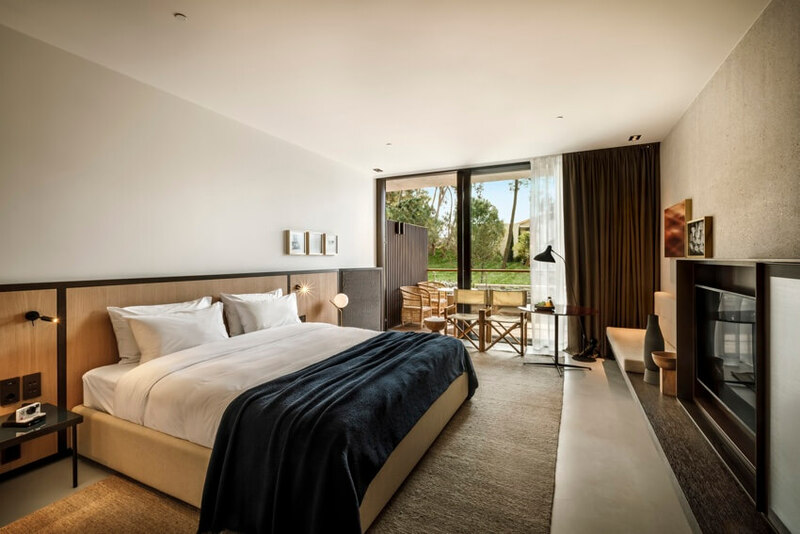 The bedroom leads to an open patio with large terrace, garden and private plunge pool. Entrances to all suites are located on level 3. Amenities: Bottle of still mineral water 0.75 l and fruit of the day combo deluxe with daily replenishment, sweet tartlet on arrival. Bottle of still mineral water 0.33 l, goodnight gift and suite VIP amenities. This suite has enough space to accommodate 4 persons, or entertain several guests. Located on the corner of the building, it features a large balcony which wraps around two sides of the suite. One of the suites doesn't have a kitchen and plunge pool. 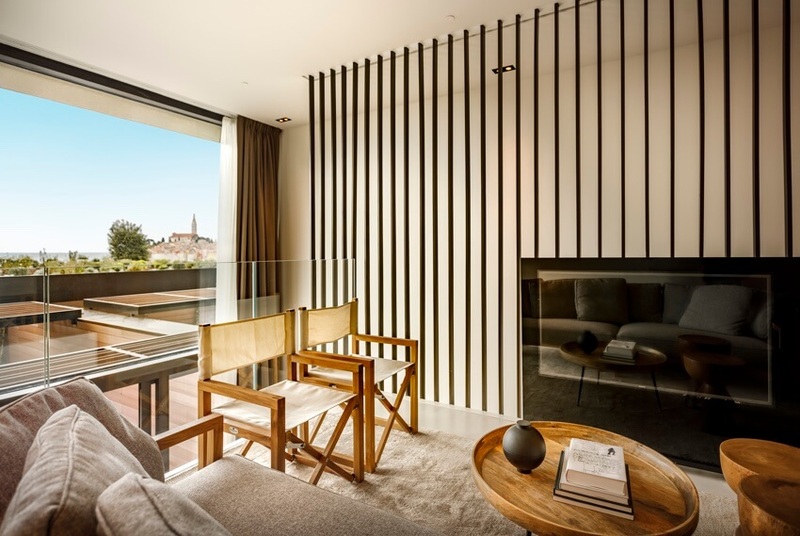 Featuring a large living room with a lounge area, a spacious balcony with sun loungers and a private plunge pool, it is ideal for entertainment and representation purposes.